As we have 23 days to Christmas, the official holiday craziness has begun. 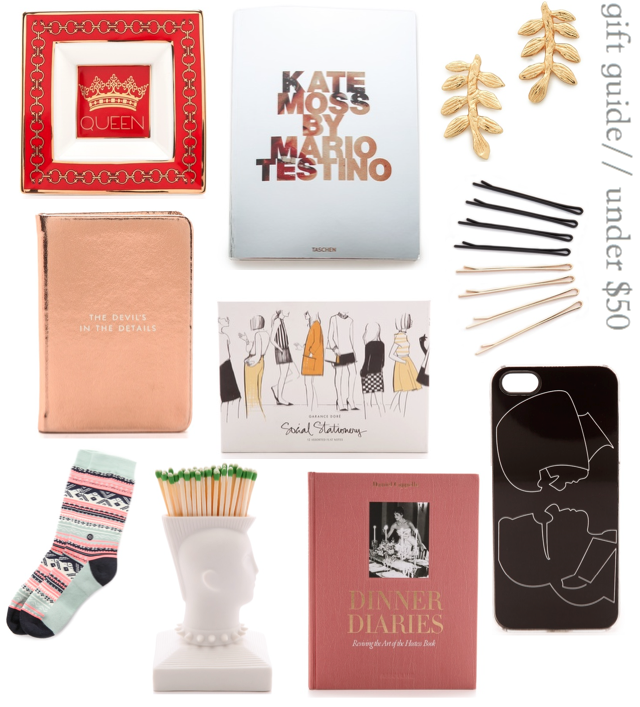 Today's gift guide might just be my personal favorite. Like my past two gift guides, all items can be found from a specific retailer. This week's lucky ducky? Shopbop. I'm obsessed with the Kate Moss book, and the most stylish best friends iPhone case... I mean, c'mon who wouldn't want that? Most of the time when it comes to under $50 gift ideas, you'll just see a whole bunch of candles- did I walk into a Yankee Candles? yeah, no- and random nondescript stocking stuffers. This budget-friendly batch works for the hostess, a stocking stuffer for your sister, and let's get real here, yourself. As I'm all about spreading some l'esprit de Noël (!!! ), some giveaways are coming your way that will make jolly ole' St.Nick jealous. I've been eyeing that dinner diaries book every time I go into Anthro! Totally in love.